“You want to do what?” asked Viv when I mentioned that we might want to try Dim Sum on our last day in San Diego. Pondering for a moment, I reconsidered my idea. Okay, we’re in San Diego where some of the best Mexican food can be found in the United States. Why are going for Dim Sum when I live in Vancouver, where some of the best Chinese food can be found in North America? I quickly changed my mind and refocused on the task at hand. Alright, Mexican food it is. But where? I had some on my itinerary; yet to be honest, they were far too touristy (aka: been on Food Network). Okay, I needed to head to a place where they served authentic Mexican food with no frills. 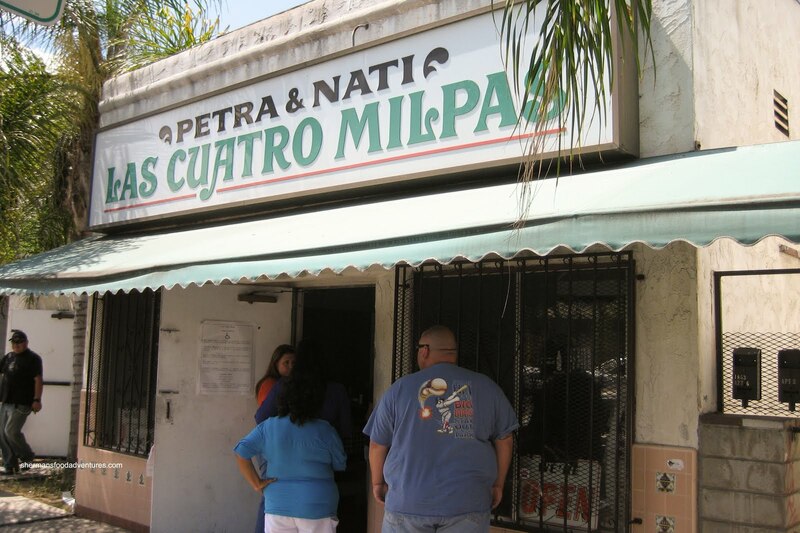 That brought me to Las Cuatro Milpas, located in Barrio Logan. Yeah, this is not exactly where a tourist would necessarily put down as a destination. I heard they make great food and for $20.00, you could feed a whole landscaping crew. Good enough for me. So I headed down there a little before 11:00pm and there was already a lineup out the door. No worries though, the line moved fast. Okay, from the outside in, the place is a dive, hole-in-the-wall or whatever you want to call a restaurant that relies on solel y on its food. So don’t expect ambiance, cute decor or frills. In fact, a few of the ladies behind the counter don't even speak English. Now that's authentic! I ended up getting takeout and we did a picnic of sorts at Balboa Park. I ended up getting 2 orders of the Rolled Tacos (5 per order). These were filled solid with tnder pork and deep fried until super crispy. 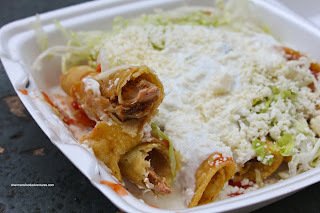 Topped with salsa, lettuce and sour cream, I like these authentic version of a Tacquito. So that's how they are supposed to be! Unfortunately, my son didn't touch his order because it didn't resemble a Tacquito... I guess he doesn't want authentic stuff. I also got 2 Tamales and once again, they were stuffed full of tender pork. I found the masa to be slightly dry, but it was still easy to eat. 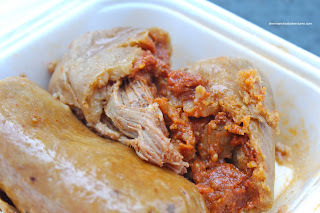 The flavours were subtle and I could really taste the meat. 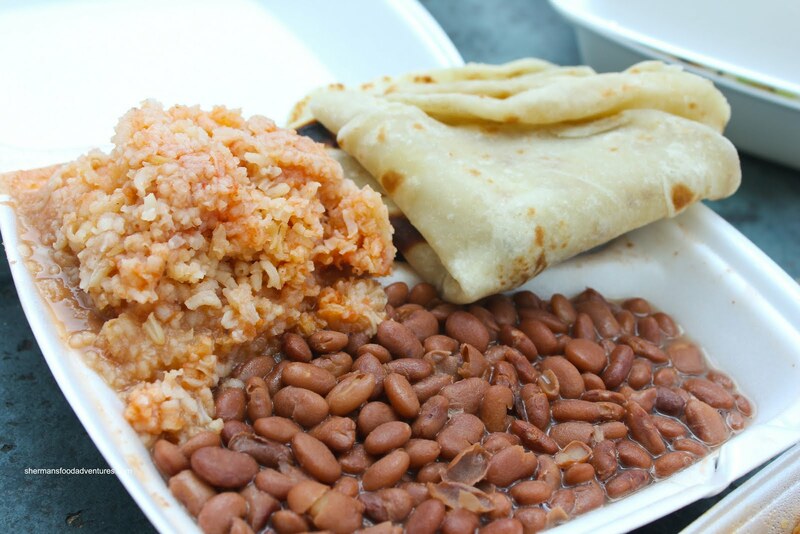 Lastly, I got an order of the Rice and Beans which included tortillas. I should've gotten the chorizo rice and beans instead, however, my kids would've have liked the spice. So it was by no surprise that this was bland. The beans were quite nice though. Heck, I really shouldn't be complaining about anything. The food was decent enough and dirt cheap.